Feminine style and glamour echo the fluid drapery and beading directly from the runway. Badgley Mischka’s exquisite attention to detail is directly translated through the latest optical collection, while featuring the highest quality products and design elements. Dora is a full acetate frame with an exaggerated cat-eye shape. Double laminated Mazzuchelli acetate creates a rich depth of color which is accentuated by a hand polished finish. Dora is available in Ebony and Caramel. Janine is a combination frame with uplifted rounded eye shape and metal frame front. Swarovski crystals adorn angular Mazzuchelli acetate temples for added dimension. Janine is available in Ebony and Toffee. The McGee Group markets ophthalmic frames, sunwear, reading glasses and cases to all customer groups throughout North America and many international markets including eye care professionals, distributors, large optical chains, mass merchants and department stores. Since its inception in 1976, The McGee Group has gained recognition as a forward thinking company by merging innovative technology with fashion, offering high quality products, superior marketing support and value-added customer service. The McGee Group currently manufactures and distributes Badgley Mischka Eyewear and Sunwear, Vera Bradley Eyewear and Sunwear, Ducks Unlimited Eyewear and Sunwear, XOXO Eyewear and Sunwear, Totally Rimless and Argyleculture Eyewear and Sunwear by Russell Simmons. 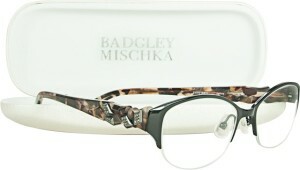 For more information about the Badgley Mischka optical and sunwear collections, visit our website at www.mcgeegroup.com or contact The McGee Group at 800-966-2020 or sales@mcgeegroup.com.